(Camden, NJ) – The first of three dogs to “graduate” from a new program that utilizes inmates to train rescue dogs to be companions for veterans was presented to Purple Heart recipient Arthur Wimberly, Jr. of Pennsauken Township. Wimberly served in the United States Army during the Vietnam War. He entered active military service on January 29, 1968, and was released from active duty at the rank of Sergeant on January 19, 1971. His last duty assignment was with Company “D” 23rd Engineer Bn. AD, USAREUR. 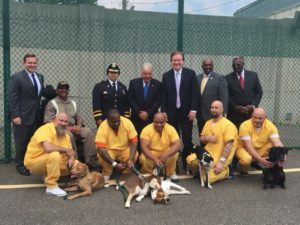 In a groundbreaking pilot program the Freeholder Board instructed the corrections department, working with One Love Animal Rescue, to train and care for companion dogs to be adopted by veterans, identified by the Office of Veteran Affairs, who will give them a forever home. Director of the Camden County Department of Corrections, David Owens views this new initiative as a first step to opening many new doors for inmates.